CALL 6: How fast are your potholes getting filled? It depends on where you live. INDIANAPOLIS -- If you’re still waiting for a nasty pothole to be filled near your neighborhood, you are not alone. A Call 6 Investigation found parts of Indianapolis waiting as much as 10 days longer to get potholes filled than other areas of the city. When you see a bad pothole, chances are you know to call the Mayor’s Action Center or use the Request Indy app. But Call 6 Investigators Kara Kenney and Jordan Fischer found after you report it, you could be waiting awhile if you live in certain parts of the city. John Solek lives off of Mollenkopf Road on the northeast side, in the 46256 ZIP code. It’s a road so riddled with potholes, drivers risk going off-roading to avoid hitting them. “See, here comes a car and he can’t make it either and I’m going to be on his side of the road because I can’t drive on mine,” said Solek. Solek’s neighbors reported the potholes to the city. But records show the 46256 ZIP code is among the worst in the city when it comes to pothole wait times. 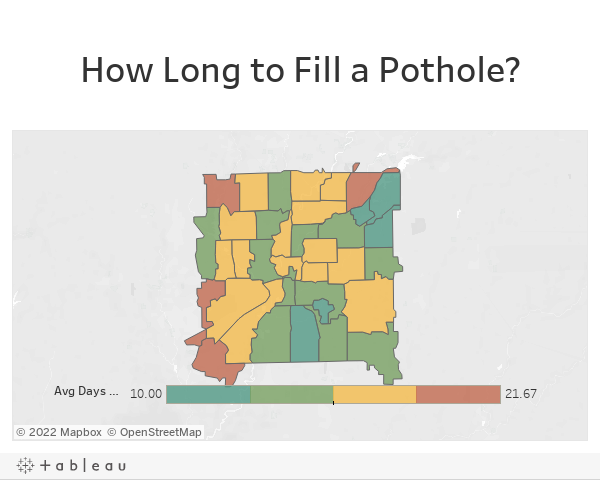 Our investigation found the average pothole request takes about 16 days to fill. But for people who live in the red-shaded areas on the map below – the average wait time exceeds 21 days. On Champion Drive, also on the northeast side, residents are also frustrated with waiting on the city to fix their potholes. “Yes, I’ve called,” said Cindy Robinson, a homeowner who lives in the neighborhood. Robinson was not surprised when we told her she has among the highest wait times in the city. “I think that's incredible,” said Robinson. “We have waited so long. We pay our taxes." Even city-county councilors say they’re frustrated by the wait – none more so than Republican Mike McQuillen and Democrat Jared Evans, whose districts have waited the longest, on average, to see pothole complaints addressed. Evans’ District 22 is located on the west side of Indianapolis near the airport. In Evans' district, drivers wait an average of 19 days to get a pothole filled. By comparison, Jeff Coats’ district on the far northeast side waits an average of nine days. That’s 10 days less than people in Evans’ district. “It’s frustrating, and there’s other things I might say but we’re on TV so I’ll be polite,” Evans said. Evans plans to ask the Indianapolis Department of Public Works for an explanation. We took our questions to Dan Parker, director of the Indianapolis Department of Public Works, who explained how the city decides which potholes to fill first. “Since Feb. 23, when the emergency declaration was issued, we have focused squarely on major thoroughfares,” said Parker. “They've been targeted based on the number of requests we receive and traffic volume. Chuck holes with more complaints and more traffic get filled faster, and neighborhood streets like Champion Drive get filled last. The city had planned to start patching in neighborhoods by April 15, but weather pushed that back to May 15. Parker said he was not surprised by what RTV6 found regarding wait times varying by neighborhood. The DPW chief said another reason for the disparity is because the city is less likely to spend time in areas with state highways, because those are INDOT’s jurisdiction. Even the location of the hot mix facilities and whether they’re open or not can play a role in who gets served faster, Parker said. Call 6 Investigates asked Parker whether there’s any preferential treatment for certain neighborhoods or ZIP codes. RTV6’s analysis of pothole data found less than a 24-hour difference on average between Democrat and Republican districts. Neither was there a significant difference in the percentage of potholes complaints closed, with Democrat districts seeing 70 percent closed on average, versus 74 percent for Republican districts. DPW didn’t have an answer, though, for RTV6’s finding that pothole complaints reported by phone are filled three days faster, on average, than potholes submitted through the app. “I don’t know why that would be the case,” said Parker. Parker said that, under normal circumstances, the city tries to fill pothole complaints on a first in, first out basis. But this year’s severe weather made that all but impossible. DPW data shows the department received 24 service requests in the first four days of the year. By Feb. 23, the number of open requests had climbed to 8,000. Parker asked people to make sure they do report potholes. Parker understands the frustration many drivers have. It’s little consolation to people who live in certain ZIP codes like Cindy Robinson. "We are last on the list, so I don't know what to do next,” said Robinson.